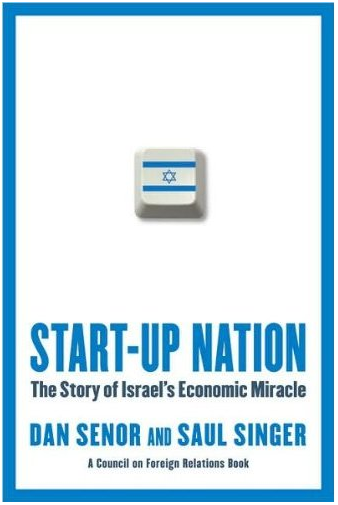 Coming back from a trip to the USA, my brother gave me the book “Start-up Nation: The Story of Israel’s Economic Miracle”, by D. Senor and S. Singer [242 pages]. The authors try to offer some hindsight and plausible explanations behind the fact of Israel being such an enterprising nation, which can be measured by the number of technological companies it has, the proportion of Israeli companies listed in NASDAQ as compared to other larger countries, its tremendous GDP growth since its creation, the VC investment per capita (above 250$, x2 times than second country in the list, USA) or the civilian R&D expenditure (4.5% of GDP). They analyze different issues throughout the chapters of the book: questioning of hierarchical orders, assertiveness (what they call chutzpah), responsibilities handled while in military service, technical training at the military, creation of clusters, etc. Some of these aspects could be learnt and applied to other countries and that it’s why I would recommend the book. Some others may lie behind Israel’s special situation and politics, and thus not easily transferable. There are several elite corps in the Isreal Defense force. Not only military service is compulsory (except for the haredim or the ultra-orthodox), but apparently the military does a long-term forward screening of next waves of recruits. They have interviews with them, they have access to their academic merits in high school, so they get to select the best qualified for certain corps, this in turn is also a recognition for the “candidates”. These elite corps offer a highly valued training and experience (see the Talpiot program). Training in a broad variety of subjects from technology to logistics, very valuable for a future career. The Israeli Defense Force also counts with a very low ratio of high officers, thus delegating much of the responsibility for decisions (sometimes life or death ones) to young officers. Once finished with the military service and university studies (45% of Israelis attended university), companies recruiting future candidates give not so much weight to academic merits in the university but to the military unit of precedence and the experience the candidate obtained during those years of service. Democratization offered by military: since the service is compulsory it continuous to offer Israelis exposure to people from different backgrounds. Life-long reserve service: once they have finished the service and go to pursue a civilian life they are still part of the reserve. In Israel, this means gathering every year for up to a month to train or perform active duty if the country is at war. This creates strong bonds between people from the same units (imagine having not a diner of ’81 class every second year, but 4 weeks every year). As they grow older, they do have a close contact with people in every rank of society. They’re truly no more than 2 or 3 degrees of separation to one another in the whole of Israel. It is definitely an interesting book to reflect on many issues and take some ideas that can be transferable to other situations than that of Israel. I think that the organisation of the military in Israel is clearly one of the aspects which would hardly be transferable to other countries. Providing weapons and delegating the responsibility of how to use them, mainly to young people, is risky anywhere. In Israel, a huge proportion of the population may assume the cost, because they’re under strong external threats, and the worst part goes to the Arab population, who suffer the abuse of the troops. In countries like Spain, who have no such clear external threats (but episodies like the Green March or the Perejil Island crisis), people are more reluctant to empower the army. The story of coups, pronunciamientos, civil wars and dictatorships of the last two centuries shows that the biggest military threat to the Spanish people has been… the Spanish army itself. And, while some aspects of the Israeli military may actually improve the country’s economy (say democratisation, recognition of merit, favouring social contacts among citizens of different backgrounds), such a military system requires huge resources to be maintained. I can’t figure how serving nearly one month a year can be economically efficient. Of course it strengthens bonds among comrades, but at enormous costs both in terms of their time and of public investing.